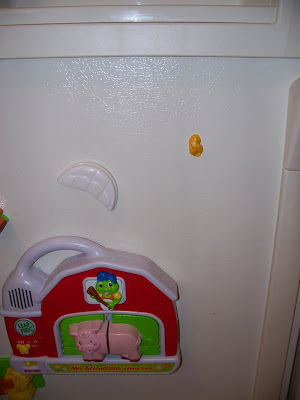 Earlier today, I noticed this small, orange blog stuck to the front of our fridge. Upon closer inspection, I realized it was a piece of gum. Why, you may be asking yourself, would there be chewed gum stuck there? After thinking about it for, oh, two seconds, I realized this gum was about 3 feet high... Perfect Addi height. So, I called her over and asked her why in the world she would do that. Granted, it's better than swallowing it, but not by much. I was planning out my lecture in my head but she explained to me she put it there so she could find it and eat it after lunch. Made total sense to her. At least that's one person who got it. Dude! Have I told you lately how much I LOVE your blog...And your crazy kids!